1980-02-02. New. Ships with Tracking Number! INTERNATIONAL WORLDWIDE Shipping available. Buy with confidence, excellent customer service! 2000-03-03. New. Ships with Tracking Number! INTERNATIONAL WORLDWIDE Shipping available. Buy with confidence, excellent customer service! Penguin Books, 1980-07-01. Paperback. Used:Good. Penguin Books. PAPERBACK. 0140055029 New Condition. . New. iUniverse. PAPERBACK. 0595142109 New Condition. . New. USA: Penguin Books. Paperback. 0140055029 519 pages. Index. Black and white illustrations. "The power and profits of the five giant companies at the center of the world's food supply." - subtitle. Clean, tight and unmarked with moderate wear. A sound copy. . Good. 1980. Reprint. Littlehampton Book Services Ltd, 1979. This is an ex-library book and may have the usual library/used-book markings inside.This book has hardback covers. In good all round condition. Dust Jacket in good condition. 1980-02-02. Good. Ships with Tracking Number! INTERNATIONAL WORLDWIDE Shipping available. May not contain Access Codes or Supplements. May be ex-library. Shipping & Handling by region. Buy with confidence, excellent customer service! iUniverse. PAPERBACK. 0595142109 Special order direct from the distributor . New. iUniverse. PAPERBACK. 0595142109 Like New Condition. . Fine. Penguin Books. PAPERBACK. 0140055029 Like New Condition. . Fine. New York: Viking Press, 1979. 2d Printing. xiv, 387p., b/w illus., lightly chipped dj. NY: Viking, 1979,. Hard bound, later printing, illustrated, maps endpapers, 387pp inc. index. Inscription front free endpaper else Very good+ in moderately edge-torn near Very good dust jacket. Multiple copies available. 805 grams unpacked. New York: Penguin Books, 1980. 519pp, b/w photos, maps and charts, index. Page edges tanned. Paperback. 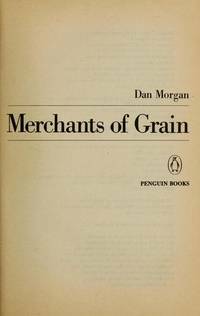 The five companies that are the subject of the book and Cargill, Continental, Louis Dreyfus, Bunge and Andre. . Reprint. Soft Cover. Very Good. 8vo. iUniverse, 10/19/2000. Paperback. Used; Good. **WE SHIP WITHIN 24 HRS FROM LONDON, UK, 98% OF OUR ORDERS ARE RECEIVED WITHIN 7-10 DAYS. We believe you will be completely satisfied with our quick and reliable service. All orders are dispatched as swiftly as possible! Buy with confidence! NY: Viking, 1979,. Hard bound, later (3rd) printing, illustrated, maps at endpapers, 387pp includes index. Very good in moderately edge torn and edge chipped dust jacket. Multiple copies available. 830 grams. All books in stock and available for immediate shipment from Winnipeg, Manitoba. NY: Viking, 1979,. Hard bound, 1st edition, illustrated, maps endpapers, 387pp inc. index, Very good+ in moderately edge-torn yet Very good dust jacket in mylar. Several copies available. 840 grams unpacked - depending on destination, extra postage may be requested. Harmondsworth: Penguin [0-1400-5502-9] 1980, 2nd thus. (Mass market paperback) 519pp. Very good. .
Penguin Publishing Group, 1979. Hardcover. Good. Disclaimer:A copy that has been read, but remains in clean condition. All pages are intact, and the cover is intact. The spine may show signs of wear. Pages can include limited notes and highlighting, and the copy can include previous owner inscriptions. An ex-library book and may have standard library stamps and/or stickers. At ThriftBooks, our motto is: Read More, Spend Less.Dust jacket quality is not guaranteed. Penguin Publishing Group, 1979. Hardcover. Acceptable. Disclaimer:A readable copy. All pages are intact, and the cover is intact. Pages can include considerable notes-in pen or highlighter-but the notes cannot obscure the text. The dust jacket is missing. At ThriftBooks, our motto is: Read More, Spend Less. Penguin Publishing Group, 1979. Hardcover. Good. Disclaimer:A copy that has been read, but remains in clean condition. All pages are intact, and the cover is intact. The spine may show signs of wear. Pages can include limited notes and highlighting, and the copy can include previous owner inscriptions. The dust jacket is missing. At ThriftBooks, our motto is: Read More, Spend Less. Penguin Publishing Group, 1979. Hardcover. Good. Disclaimer:A copy that has been read, but remains in clean condition. All pages are intact, and the cover is intact. The spine may show signs of wear. Pages can include limited notes and highlighting, and the copy can include previous owner inscriptions. At ThriftBooks, our motto is: Read More, Spend Less.Dust jacket quality is not guaranteed. Penguin Publishing Group, 1979. Hardcover. Acceptable. Disclaimer:A readable copy. All pages are intact, and the cover is intact. Pages can include considerable notes-in pen or highlighter-but the notes cannot obscure the text. At ThriftBooks, our motto is: Read More, Spend Less.Dust jacket quality is not guaranteed. Penguin (Non-Classics), 1980-07-31. Paperback. Good. New York: Penguin, 1980,. Trade paperback, later printing, illustrated, 519pp, notes on sources, index. Spine faded else Very good in card covers. 360 grams unpacked. Multiple copies available of this classic. New York: Penguin, 1980. Trade paperback, later printing, illustrated, 519pp, notes on sources, index. Minor bump to bottom front corner at spine else Very good in card covers. 360 grams unpacked. Multiple copies available of this classic. Penguin. reprint,1980. Good+ soft cover. 12mo,soft covers,519pp,illus. edgewear,rubbing,scrapes,corners wearing,tanning,cover. corners bumped,tanned,clean,tight,text. business. New York: Penguin, 1980,. Trade paperback, later printing, illustrated, 519pp, notes on sources, index. Spine a bit faded else Very good in card covers. Multiple copies available. 360 grams unpacked. Penguin. reprint,1986. Good+ soft cover. 12mo,soft covers,519pp,illus. edgewear,scratches,scrapes,small tear foot front,creases,corners curled,cover. marker line footedge,corners bumped,tanning,clean and tight. business. New York: Penguin, 1980,. Trade paperback, later printing, illustrated, 519pp, notes on sources, index. A bit cocked with minor tear to heel of spine at front cover else Very good. 360 grams unpacked. Multiple copies available of this classic. Penguin (Non-Classics). Used - Good. Shows some signs of wear, and may have some markings on the inside. Penguin (Non-Classics). Used - Good. Ships from Reno, NV. Shows some signs of wear, and may have some markings on the inside. 100% Money Back Guarantee. Shipped to over one million happy customers. Your purchase benefits world literacy! Penguin. reprint,1980. Good soft cover. 12mo,soft covers,519pp,illus. edgewear,rubbing,creaes,spine creases,nicks,yellowing,corners worn,cover. corners bumped,tanning,clean and tight text. business. New York: Penguin, 1984,. Trade paperback, later printing, illustrated, 519pp, notes on sources, index. Near fine in card covers. 385 grams unpacked. Multiple copies available of this classic. Penguin. reprint,1980. Good soft cover. 12mo,soft covers,519pp,illus. edgewear,rubbing,corners curled,scrapes,foxing,dampstain top front corner,cover. top corners bumped with dampstain. text tanning,clean and tight. business. Penguin Books. Used - Acceptable. Acceptable condition. Dampstained. Insecting on edges of front and back cover. Penguin Books. Used - Good. Good condition. New York: Penguin, 1980,. Trade paperback, later printing, illustrated, 519pp, notes on sources, index. Front cover moderately creased else Very good in card covers. 360 grams unpacked. Multiple copies available of this classic. New York, NY, U.S.A.: Penguin Books, 1980. Unknown Printing. Trade Paperback. Fair. Brief summary of content available on request by e-mail. New York, New York: Penguin, 1980. Softcover. Very Good/No Jacket. Used Book: Trade Paperback Standard used condition. Reading copy or better. Penguin Books, 1980-07-31. Paperback. Very Good. Penguin, 1980. Pages have tanned with age, light cover wear.. Trade Paperback. Good.